Are Costs of Customer Acquisition Controllable? In the last two posts “Customer Acquisition when Revenue Growth is Stagnant” and “Two Important Metrics for Your Customer Acquisition Process”, I discussed the cost to acquire a customer. Should you consider this to be a fixed cost? Or is this a cost which you can reduce? If you understand the importance of the ratio between the value of a customer and the cost to acquire a customer, then you realize that if you could reduce the cost of acquisition, you could grow your business by approaching smaller (i.e. lower value) target customers because you can maintain a reasonable ratio of value to cost. In this post I would like to explore three factors which are underlying marketing drivers to your customer acquisition cost. These drivers interact and build upon each other. Furthermore, these are drivers you can influence, direct, and control in your business. 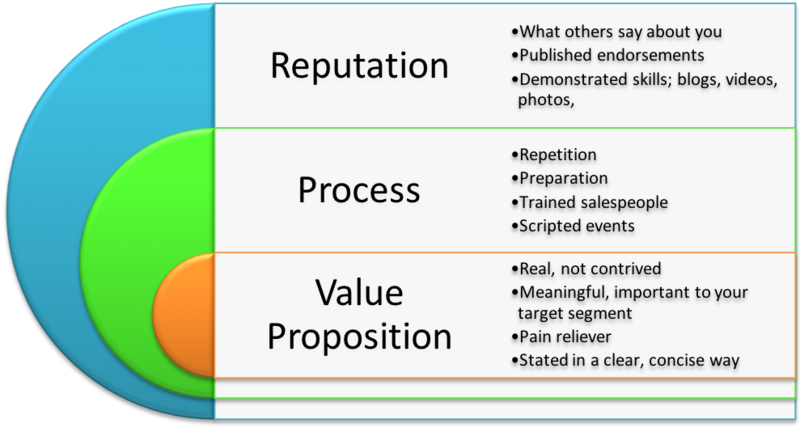 Many businesses struggle with the expression of their value proposition. In brief, your value proposition is what you do for your customer compared to the next best alternative. For most businesses, the alternative is a competitor. For a few, the value proposition is something which compares to a manual process; automation versus labor for example. Another way of understanding value proposition is to ask yourself how life is changed for your customer by doing business with you compared to what they were doing before. The strongest value propositions are those which eliminate a pain point, remove a hassle, or stop an aggravation for your target customer. Value propositions can be emotional. They can simply make your target customer feel good about doing business with you. Products or services which serve a social good, for example, have “value”. To lower customer acquisition cost, you can look for ways to add more to your value proposition. What does your target customer do just before or just after they use your product or service? Who else do they need to call? How easy is it to do business with you? Another useful exercise is to identify all the key elements of the competition’s value proposition. Is there anything they do which you could add to your business model to obviate an advantage they have? If you can repeat the process for acquiring a customer, your skills will improve. Each time you execute the process, you learn something and you can make subtle but important changes to the way you deal with every potential customer. Visualize their experience. If they visit your business, where do they park? How are they greeted? What is the first thing they see? Is the first impression a mess or a dirty lobby? Tired plastic plants? Figuratively, if not actually, prepare customer interactions like you would a script. I worked with a business where we picked up customers at the airport with a clean, shiny Mercedes. We dropped them at the front of the business. They were greeted and immediately ushered to a conference room with a view where there was a tablet, a pen, and a bottle of water. People from the business interacted with them the same way for every visit. Everyone involved from the business knew their role and their deliverable to the process. We had a very high close rate on these customers. In contrast, I have a friend who once visited a company and the person picking him up was drunk! Good first impression, huh? When everything is scripted, you tend to avoid misalignment in your message. You leave customers with the impression you know what you are doing, you’re confident, and ready to serve them. If your target customer is an enterprise employee, the value proposition for them might be “promotion to a better paying position”. What they don’t want is a decision to do business with you which backfires on them. They need success to be promoted. In the world we live in today, your reputation is largely controlled by what is said online. When people consider doing business with you, especially strangers, their searches are likely to bring up postings to places like Yelp, GlassDoor, and many other places which solicit comments. If you have satisfied customers, ask them to give you reviews. Most are pleased to help. Be sure all the online places where a target customer does diligence are in alignment. Your website, company pages on LinkedIn and Facebook and others should all say similar things. Likewise, your personal profiles and those of your employees should all serve to “sell” your company. Online presence is not new, but its importance continues to grow. Those who don’t use it are typically Baby Boomers … and they are rapidly leaving the business world. The next generations are drawn to online tools. I recently posted a Yelp review for one of my clients. Admittedly this client is in an industry where you can be almost certain that everyone considering doing business does online diligence. Nevertheless, I was astounded that my review generated over 400 views in the first month after it was posted. The only conclusion I can make is you would be prudent to control what potential customers find, and give them a lot to find. Enhance your reputation by actively demonstrating expertise in your business. Blogs are one way to do this. Sharing relevant content from others can build your reputation. Likewise, hosting a “lunch and learn” for a customer is a very effective tool. If you have a weak value proposition, a chaotic way you handle potential customers and little or bad online reputation, do you think it will be easy to get new customers?